riental’s Town Board voted Tuesday night to allow a Walmart store, proposed for outside the town limits, to tap in to Oriental’s water system if Walmart agreed to be annexed in to the town after its building is completed. Oriental’s Town Board on Tuesday night. From left, Commissioners Michelle Bessette, Warren Johnson, Mayor Bill Sage, Commissioners Barbara Venturi and Larry Summers. All but Warren Johnson are seeking re-election on November 5. Absent from the dais was Commissioner Sherrill Styron. That timing would mean the proposed 12,000 square foot structure wouldn’t have to comply with Oriental’s Growth Management Ordinance which limits commercial building size to 8,000 square feet. Nonetheless, at least one Commissioner suggested that demanding annexation after the fact might be asking too much of Walmart. 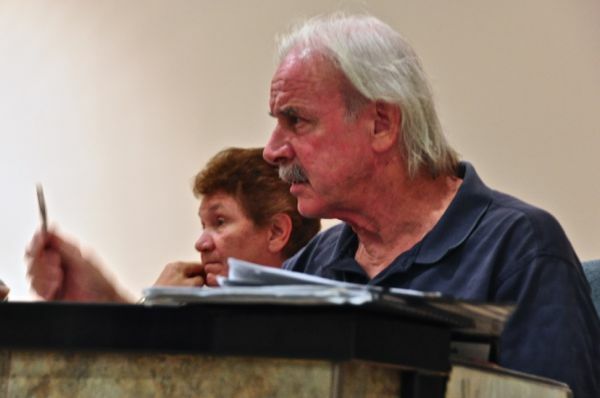 Commissioners Barbara Venturi and Larry Summers also delivered rebukes to the Walmart opponents, some of whom were in the audience, who wanted the Town to use the water as a negotiating chip. Commissioner Larry Summers at right, and at left, Commissioner Barbara Venturi, who both criticized the opposition to Walmart. Summers suggested it was racist to deny town water to Walmart. Venturi suggested 121 residents signing a petition saying they did not welcome Walmart near Oriental were not enough to persuade the Board. Oriental’s water service ordinance says that requests from out of town property owners for water service have to go to the Town Board for review. That’s what put the item on Tuesday’s agenda. Walmart had asked the Town for water service. Town water pipes run up and down Hwy 55, extending to Straight Road and down White Farm Road to the eastern side of Oriental. County water pipes stop at Straight Road. The lot on Hwy 55/Broad Street Extension now owned by Chris Fulcher where Walmart plans a store just outside of Oriental. 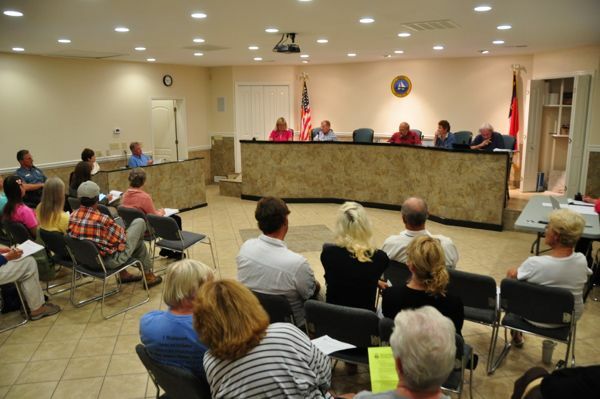 Since it’s not in town it would not have to pay town property taxes nor abide by the town’s criteria for new buildings. It can ask the Town for water service, and the Town Board has said yes. For Walmart, Oriental’s water service would represent a far cheaper option than the county water system. 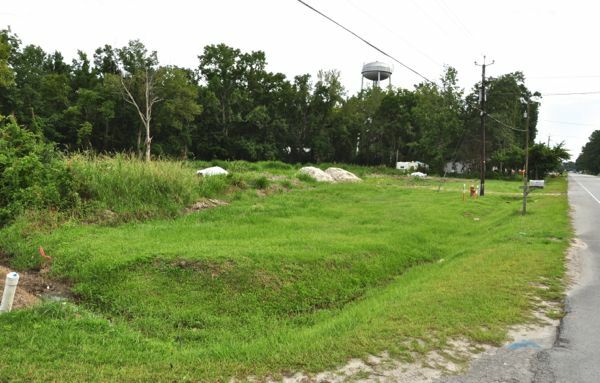 Al Gerard of the Pamlico County Water Department says it would cost Walmart at least $100,000 to extend a 6” water pipe from its Hiway 55 lot to the nearest county water main at Straight Road. (Walmart would then have to deed that over to the County.) The County also charges an impact and tap on fee of $12,000, more than twice what Oriental does. And the monthly water bill with the County would be $18 more. Oriental Town Board’s meeting Tuesday night. Those comparative figures were not before the Board in its discussion Tuesday night. 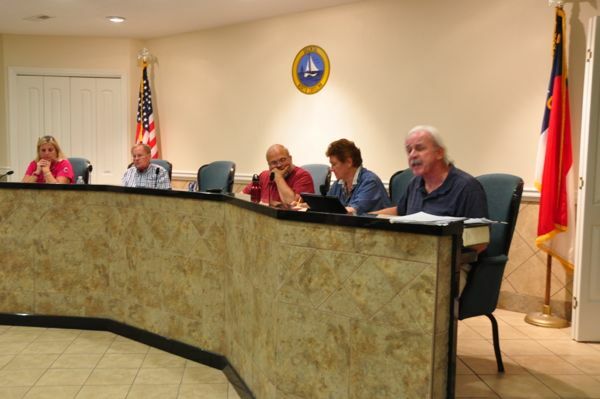 At an agenda meeting on September 27, Interim Town Manager told the Board Walmart would have to pay $25,000 for a 2” pipe from Straight Road. Though it was not brought up Tuesday night, a 2” pipe width may not be feasible given the distance it has to run. A 6” pipe would be necessary, says Al Gerard. Those opposed to the Walmart just outside Oriental have latched on to the water issue. They oppose the Walmart on the grounds it would hurt the in-town businesses who are the Board’s constituents, and they called on the Board to use the water as leverage.